For luxury SUV and crossover owners, there hasn’t been a lot of choices for replacement tires…until now. 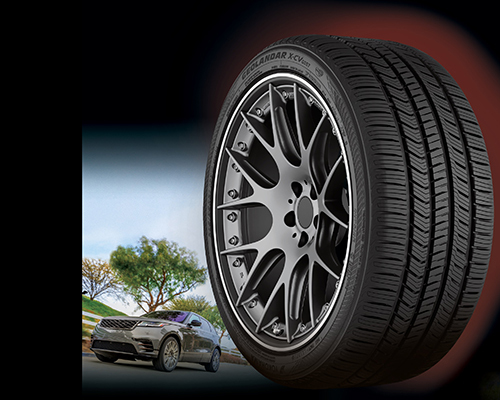 Yokohama Tire’s new GEOLANDAR X-CV™ fills the need with 23 W-speed-rated sizes, covering nearly all 18- to 22-inch luxury SUV/crossover fitments. The tire is now on sale in the U.S.
-- Powerful braking is insured with an asymmetric tread pattern that is coupled with 2D and 3D sipes for reliable, short-stopping distance in wet and wintery conditions. -- Long-lasting treadlife is achieved via a wide, flat construction profile that provides a rectangular contact patch that evenly distributes stresses for long, even wear. -- Precise handling comes from the reinforced shoulder and two centers rib that enhance stability and dry handling. -- A hush-quiet ride is accomplished by a staggered tread pattern in a five-block sequence which reduces pattern and road noise.